Front-End Analysis: interviews, focus groups and surveys indicate current conditions and barriers that may need to be addressed before a 1:1 can be successful. Report Presentation: The analyis report is presented in a principal meeting to determine whether the conditions for course success are in place or can be established. If not, recommendations for remediation are made. Principal Mentoring: An expert site facilitator helps Course Coaches and school administrators understand the model and requirements for the course, and establish necessary supports appropriate to each site. These include establishing regular release time, reward or promotion structures, and other arrangements. Course Mentor Training: The site facilitator works with teachers who have volunteered (and negotiated with the principal for supports) to support teachers taking the course, and provide tech coaching also to those on individual learning paths. Teacher Orientation: All teachers create ePortfolios from Going121 Google Site Templates. These are used for documenting and reflecting on work, through file archives and blog posts. Formal Course: A Canvas LMS course is copied to a free school account for local customization by course mentors, who will choose topics, facilitate course discussions, and lead peer reviews. Community of Practice Support: Course mentors create websites from Going121 templates to facilitate sharing local experiences and discussing best practices as teams. Project Showcase: At the end of Course II, an end-of-year showcase conference formally promotes sharing of project-based learning units developed during the course, so that teachers can learn from and adapt each other's successes for their own courses, and also ask the critical questions that push their peers to improve and extend their early efforts for greater impact. 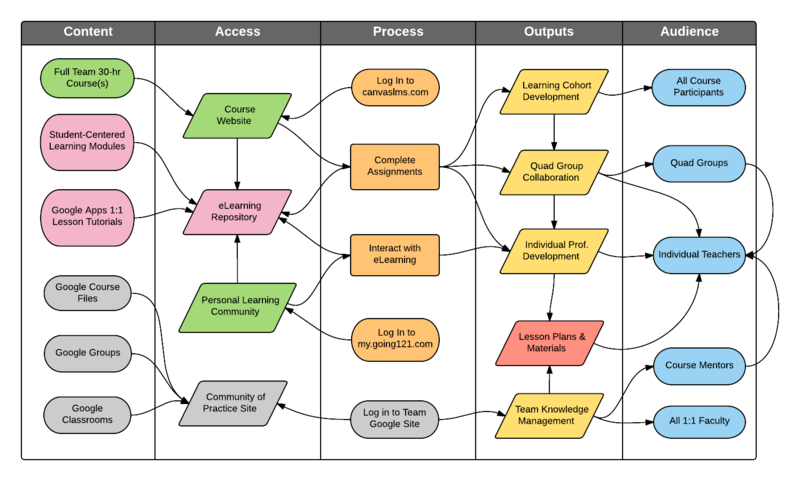 By facilitating site-level changes to sustain a culture of collaboration and innovation, by enlisting peer mentors to situate learning within the local context , and by applying software training to each core content-area, G121’s solution model addresses each of the top three factors Project RED identified it its landmark study, removing the barriers to achieve the promise of going 1:1. Contact us to explore Going121 for your school.